Reach more prospects and expand your digital footprint with a single click. Let’s talk about email marketing. While it may be something that triggers an eye roll due to its bad wrap as junk mail, it’s honestly a very big piece of your sales and marketing strategy – or at least it should be. As social media becomes more fragmented, focusing on personal stories and less on business-facing material and postings, email is going to increase in importance and visibility, more than it already has in fact. Email marketing is a way to reach those who have a real interest in what you do and offer. Those who receive your emails and newsletters have subscribed to your RSS feed or email list by choice. That’s a big deal and different than liking a social page or forcing your content in front of an audience of disinterested individuals through sponsorships and ads. They want to hear from you, so give them a reason to listen up. Let’s solidify this claim with a few statistics, shall we? They pack a punch. Through email you can market directly to your customers, who have opted INTO your program and already expressed interested. Leverage that with unique, read-worthy content that will keep you top of mind. Are they going to make a purchase or convert from onlooker to loyal customer right away? Maybe not. But through email you can have a personalized one-on-one conversation, which is not something you can do on social very easily. Social media posted on any channel, Facebook, Twitter, Insta and the like, is fleeting. Maybe they liked or even commented on your content, but in the blink of an eye, it’s buried, and they are thinking about and liking something else. Email lasts. Maybe they don’t open that message right away, but it’s there. A quick search will pull it back up when they are ready to dive in. It’s a much more permanent way to communicate and places your business squarely in front of real prospects. 1. Take steps to grow your list. Give people an opportunity to opt-in and start receiving your communications. Provide a sign up on your website, social media pages, and online store. Provide a link for email in your electronic signature and ask at checkout virtually and at brick and mortar locations. Make it a constant customer facing bullet point. Be sure to ask for the following information: name, email, birthday/anniversary, zip code and mobile number (you may want to do SMS marketing next). For B2B customers you might ask for their name, email, title, company. Keep in mind that making fewer fields required will increase sign-ups. 2. Provide an incentive to sign up. An effective way to encourage sign up is by providing a carrot to your audience. That could be a unique piece of content such as a technical or consumer report, eBook, how-to, or white paper. If you go this route, ensure that what you have to say is truly yours. It should be relevant and authentic because people can smell a copycat from a mile away. There could be a first purchase discount involved, give-way, contest, or entrance to a birthday/anniversary club. Incentives such as these provide value to your audience and give them a win-win scenario. Informative content or discount and unique, entertaining news from a business I’m interested in? Yes, please! Bottom line, they need to be a part of something. 3. Tailor your content through email list segmentation. Not to get overly analytical (we can’t help ourselves though), continually building a robust email list is a great first step, but you should also think about customer categorization and personalization. As we said before, email gives you an opportunity to have one-on-one conversations with people. Take advantage of that by sorting and tagging your email subscribers based on different variables such as sign up source, interests, birthdays, recent purchases, etc. List segmentation allows you to craft messaging around that interest, instead of sending out mass, over-generalized information that people do categorize as junk mail. List segmentation is part of any online email service such as Mail Chimp or Constant Contact. Many of these email marketing services provide online tutorials, templates, and integrations that make using their service very simple and streamlined. And, we’re always here to help you set it up too. If you have a unique opinion on an industry trend that would be worthwhile, share it! But don’t overshare. Too many emails will generate audience apathy, a good rule of thumb to begin with once a month and go from there. This may seem overwhelming, but through email automation, certain templates and messages can be preset and triggered based on a myriad of different things, this is all part of an effective email marketing sales funnel – more to come on that in the near future. Measure What Works, Then Repeat It. Once you have a solid email schedule established, monitor and track results to fine-tune your strategy. Keep a file handy to track the number of emails successfully delivered, opened, and clicked through to compare, contrast, and improve. Perform A/B email testing by sending out two emails with slight differences such as subject lines, calls to action, and images, but with similar body content. Analyze what email performed better, then repeat that template, and test it against something else. Email marketing is a science in that it’s constantly changing. The flexible nature of humanity, trends, and offerings means that your message has to change alongside society too. Know your target audience and always ask yourself, “Why would they sign up for an email from you?” Adapt your email outlook based on the answer. Remember, this is just part of an overall marketing plan that involves social media, search engine marketing, content generation and a slew of other things. Doing this by itself will not give you the results you’re looking for but establishing a consistent email marketing calendar in tandem with additional marketing efforts will certainly boost your visibility and most importantly, your sales. 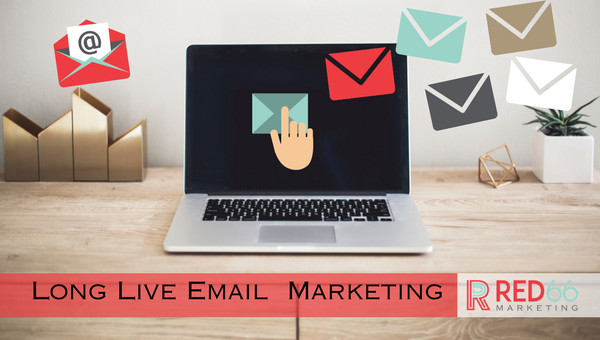 If you would like to learn more about email marketing or would like to get started, but you’re not sure how (or you just don’t have to time to figure it out! ), contact us. At RED66 Marketing, email marketing is a big part of the services we provide for clients just like you!